Signs of a Stock Bubble Are Everywhere. Here’s Another One. The article above described the stock market (and other markets) as a bubble. Where’s the proof for this? Actually, it’s everywhere. The Shiller CAPE ratio is at levels only seen at the 1929 crash that started the Great Depression, and the 2000 dot.com bubble. Likewise, the market capitalization-to-GDP ratio is above the level of the 2008 panic and comparable to the 1929 crash. The list goes on, including consecutive days or weeks of market advances, historically low volatility, near-record P/E ratios and unprecedented complacency on the part of investors. This article adds another warning sign to the list. It points out that certain high-yield (or “junk bond”) indices have fallen below their 200-day moving average. This can be indicative of a stock market correction. Junk bonds are riskier than equity. When they get in trouble, it’s a sign that the corporate issuers are having trouble meeting their obligations. That in turn is indicative of reduced revenues or profits, tight financial conditions, and lower earnings. Panics in October 1987 and December 1994 were preceded by distress in bonds about six months earlier. 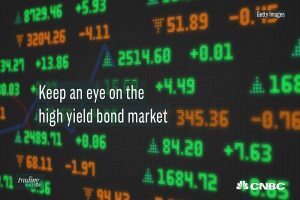 While there is no deterministic relationship, bonds are a good leading indicator of stocks because they are higher in the capital table and feel distress sooner. The October 1987 one-day 22% decline in stocks, and the December 1994 Tequila Crisis in Mexican debt were ugly for investors. The bond market gave a six-month early warning both times. It may be doing so again.